Joe Paterno – head coach of Penn State for roughly 2,000 years – loves to run the ball. That means that at least one of his tight ends takes on blocking duties while the other grabs the lion’s share of passes (pun intended). Mickey Shuler found himself in such a situation this year. While Nittany Lion teammate Andrew Quarless had the type of season that got him invited to the NFL combine (41 catches, 536 yards, three touchdowns), Shuler (11 for 89, two TDs) went unnoticed. The 6-foot-4, 250-pounder improved his draft status with a strong pro day, including a 4.62-second 40, 28 bench press reps and a 6.7-second 3-cone drill, the last of which bested all times for tight ends in Indianapolis. Shuler took a quick break to discuss his pro day, his Nittany Lion career and how he ended up following his well-known father (former PSU and NFL tight end Mickey Shuler, Sr.). Well, let’s start out by finding out where you are and what you’re up to. Right now, I’m in Key West. I came down with one of my buddies, one of my teammates. My parents and my grandparents are down here. Came down to take a few days off and get some fishing in. After the pro day, you kind of – we were building up to that, so we need a few days off here. Came down to relax. That sounds great. Is this just a short break, and then you’re getting back into working out? What are you plans for the next few weeks? Yeah, oh, we already started working out again down here. We stopped lifting maybe that Wednesday… until that Monday. So, I’m already back working out, but we’re down here for a few more days. It’s kind of just a waiting game right now… We actually bought a one-way ticket, so that if a team calls and we have to fly back, we can fly back whenever. But I’m heading back to Pennsylvania in a few days. Again, it’s just working out and waiting around until maybe you get a call for a personal workout. Or, if not, then I guess draft day. Have you been able to meet with any teams after your pro day? Oh, yeah. I talked to most of the scouts there – not most of them, but a handful of those guys. They all said that they’re going to go back and watch film more, and they have to meet with the other coaches and things. So, they still needed to get some workouts or some digits, but I’m still waiting to hear back with all those things. And how are you feeling about your pro day? Good. I was pretty happy with the numbers that I put up. I had a goal set in mind, you know, for each event, and I was pretty close in all of them to what I expected to do. What I wanted (the pro day) for was just to open up some eyes since I didn’t get to go to the combine or the Senior Bowl or anything like that. It was kind of my first, you know, go-round in front of scouts to show them what I can do. And actually, I thought I had a pretty good – when we did the receiving, with the position-specific stuff – I felt pretty good in all those drills, and hopefully somebody liked me. You just need one person to fall in love with you, and that’s what I hope to gather, just to come out and do exactly what I did: open some eyes. Did you watch the combine at all? Were you thinking about what kind of numbers you could put up in comparison? Yeah. I definitely watched it, and I think I should have been there. Well, I know I should have been there. But, you know, it was kind of hard for me to watch and see some of the guys that I knew that I was better than and that I could have put better numbers up than they did. But it’s all right that I didn’t get to go. I got to see everybody. They already set a bar, so it was for me just to try to get to the top of that, and in any event that I could, I wanted to try to be the best at it. Could you figure out why you weren’t invited? Was it a matter of, maybe they didn’t want to take two tight ends from Penn State, or just a matter of how you played the position this past year? What do you think it was? When I looked at it – I mean, when you go down and look at the list – it’s either receivers or blockers (at tight end). The receivers are the guys that caught at least 30 balls, and the other guys were the guys that were 6-6, 270 pounds, bigger guys. There weren’t that many guys that were a blocker and a receiver, pretty good at both of them. You know, they told me I had a vote or something like that, but I just didn’t make the cut… Coming out of the year, I thought I had a pretty good shot at it, to get invited. I knew it was going to be on the bubble, but it’s a numbers game, and I just didn’t have the stats. They don’t look at how good you are at blocking; they don’t count those. It’s all “30 receptions for 500 yards” or something like that, that’s kind of what (makes) their eyes pop out. During the season, did you feel like you weren’t getting enough chances at receiving, or was that in your mind at all? Yeah, it definitely was. I mean, I was open a bunch, but it just was a matter of the quarterback finding you. A lot of times it just seemed to not work out for me when I would be in there, and then the other guy would go in, and for some reason he would get the ball thrown to him. But I am a receiver, and I can run, and can get open and I can catch the ball, but I just wasn’t used that way. 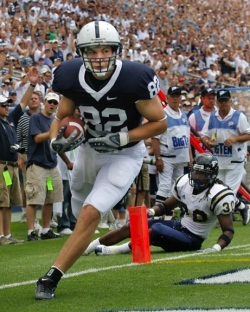 At Penn State, for some reason, they told me to be the blocker and the other tight end to be more the receiver. Did that turn out to be something where you started focusing more on blocking, or you were trying to keep your skills open to both? Yeah, you’ve got to keep them up on both, but I feel that receiving comes more naturally to me. Blocking’s something that I think you have to work harder on: getting the right footwork, getting the hands inside, staying low, using your leverage. Especially for a guy my size, 250 pounds, and you’re blocking a guy that’s 280-285 pounds, a little bigger than you. So, you really have to be sound in your technique to be able to move somebody that’s bigger than you. Let’s talk about your decision to go to Penn State. Judging by who your father was, was it your decision? (Laughs.) Yeah, it was definitely my decision. I mean, I grew up going to Penn State football games when I was a little kid, and sure enough I wanted to play for the team. We were watching and idolizing these guys. I did have to look at other schools because Penn State didn’t offer a scholarship until late, I guess it was February my senior year, basketball season. So, I did have to go around and look, and maybe look at a walk-on on a bigger school, or even at Penn State. But when they came and offered a scholarship, I mean, I took it right away. So it wasn’t a big decision for me. Oh, we visited a bunch. I didn’t really have – you know, Penn State was the only big-time school I had an offer from. Any of the 1-A schools I could have went to, but we looked at Virginia, North Carolina, Duke. We just went on a trip down South, there, and just looked at all those different schools. I kind of had to keep my options open. But the thing that kind of hurt me, I think, was that a lot of the guys didn’t think I was really serious in coming there, because of my father and my ties with Penn State. Sometimes we’d go in there, on a visit, and that’s one of the first things they’d ask: “Are you really serious about coming here if we offer you a scholarship?” Yeah, I was, but kind of in the back of my mind I had Penn State locked in, if they would have offered me. You said you played basketball in high school. How serious were you with that? I was definitely pretty serious. I was a three-sport athlete, actually. I did track, also; I ran the hurdles. But, my senior year we made it to the state playoffs in basketball, so we weren’t too bad. I think if I was a little bigger, maybe I would have gone to college and played basketball. Football was just a better fit for me, and trying to go pro in either sport, definitely my size just fit better in the NFL. Because otherwise I’d have to be a guard, and I wasn’t a guard, I was a power forward/center. In terms of basketball, how does that help you in football? It teaches you to use your body. You know, when you’re posting up down low and you have a defender on your back and you’re trying to get the ball, you’ve just got to use your body to shield him… and the same thing when you’re playing football. You run a pattern, say a five-yard stop, like a turn out. You have that linebacker on your inside hip, or if he’s on the outside, you go inside. Either way, you’re holding him on one hip, and the quarterback’s going to lead you away. So, it’s really similar to basketball. And in pass-blocking. When you’re playing defense in basketball, it’s similar to pass-blocking in football. You’ve just got to stay in front of the guy, mirror him. In football, you have contact, obviously… but it’s really the same stuff, and you learn footwork and get better with your feet when you play basketball. How would you describe the offense at Penn State? They try to say that they went to a Spread HD offense. I guess they like a big name on it, but I don’t think the offense up there has changed in, I mean, I don’t know how many years. It’s still the same base stuff. We’re a run-heavy team, but we have gotten to (do) a lot more throwing. That’s one thing that has changed. But, you know, Joe has still got his roots in the run game, and that’s what you need – that’s what we wanted to be, a strong run team and then use the pass (to mix it up). Sometimes we couldn’t do that, just because of certain situations, but I felt Penn State had a good team on offense and defense. We had good linebackers. They’re known for Linebacker U, but me and my dad always joke around and say it should be Tight End U. We’ve got a bunch of tight ends: Troy Drayton, Kyle Brady, John Gilmore, my father, ones that got to be in the NFL and have good careers. Speaking of that, what do you think you might need to work on to prepare for next year? You know, definitely, I’ve got to get bigger and stronger. And really, for me, I’m going to have to get into the film and learn to look at it in a lot more detail than I think we did at the college level. Because, obviously, it’s your job. It’s your life when you get to the NFL, and you’ve got to put everything, all your energy, into it. You’ve really got to study your opponents. You’ve got to be sound in your technique in blocking, with your footwork and your hand inside and leverage, like I said before. And then there’s hitting. And, you know, you can’t be a step late because that ball’s already there, otherwise it’s intercepted if you’re not there. So, you’ve got to be crisp in every aspect of your game, and in the NFL, you can’t afford – or you won’t get away with – some of the things you did in college, and just get away with the athleticism in college. In the pro level, you’re not going to be able to do that. Well, Mickey, I really appreciate your time today, and I wish you a lot of luck in the next few weeks. Thank you, I appreciate it. It was nice talking to you.